Enrolling your little one into child care will be one of the most important decisions a parent makes. You want to select a centre and education team that feels right to you and makes the settling in process a positive and worry-free experience. Reach out to a friend who is looking to settle their child into early learning and share with them your experiences and what you love about us here at Parkside Early Learning Centre, there’s room in our family. 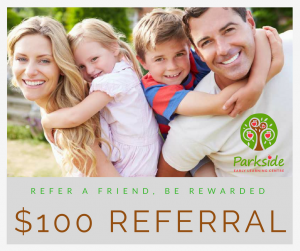 A friend or family recommendation is the best compliment that we could receive, and with the introduction of our ‘Extend the Parkside Family. Refer a friend. Be rewarded’ program, you can help us continue to grow our community and centre with friends who are already connected in some way. The referral can be initiated by way of contacting us at Parkside Early Learning Centre or by completing the web form below. Just give us a call on 07-54827738 or contact us online here.